The changing spaces of life and work have been a catalyst for change in education. The roles of students, teachers, and the school are being redefined, though it may look and feel similar to what John Dewey envisioned in 1897. Dewey (1897) envisioned schools as an ideal community to develop the potential of all citizens; benefiting society as a whole. For Dewey, knowledge was best learned through social interactions, allowing opportunities for students to connect information and new experiences to their own life. Through education, Dewey believed that students would gain access to a community, not only within the school but also society as a whole. Knowledge was a collective effort, passed down and shared among the community members through social interaction. Interactions would be used to initiate and sustain learning. Dewey would have found comfort in the current paradigm shift that is happening in education; finding comfort in the transformed roles of each member of the educational community. As a member growing up in the 21st century, students have unique needs that must be met by the educational system in order to thrive within the global economy. The specific skills needed to live and work within an interconnected world are debated regularly but are found to have common themes. 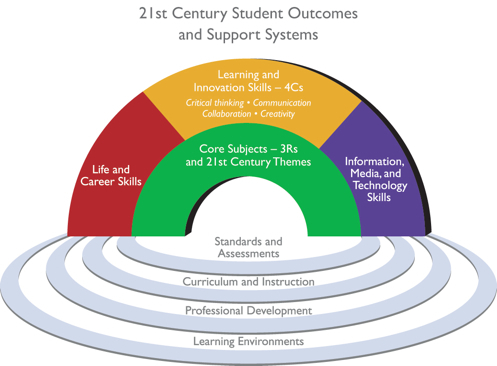 As depicted in the graphic above, along with core academic subjects, students should be expected to develop life and career skills, technology skills, and learning and innovation skills (P21.org). Learning is multidimensional, therefore students must activate a variety of skills when learning that spans time and space. Essentially, learners must learn how to learn (Tapscott, 1998) with the ability to gather information from a variety of sources, connecting themes, synthesizing concepts, anlayzing information and problems, utilizing networks of knowledge, and applying conclusions to solve problems; all the while being flexible, communicating clearly, and collaborating effectively with peers (Angelo, J., Conners, K., & Helkowski, T., 2009; Christensen, C.M., Horn M.B., & Johnson C.W., 2008; Lambert, M., 2001; Partnership for 21st Century Skills; Tapscott, 1998). Learning is continuous, with students no longer graduating to life-long careers, but life-long learning creating a “portfolio of expertise and work,” (Lambert, 2001, p. 3). Teachers in the 21st century must become facilitators within the knowledge community in their classroom (Christensen et. al, 2008, Lambert, 2001). Instead of monolithic pedagogy, teaching reflects the importance of creating a learning environment where exploration is encouraged, learning takes place through real-life situations, real-life problems are analyzed and connected to past and new information, 21st century themes are integrated within core subjects, critical thinking and collaboration are paramount, and the learners are at the center of the process (Christensen et. al, 2008; Lambert, 2001; Partnership for 21st Century Skills; Tapscott, 1998). Within this framework of teaching, the importance of literacy skills is crucial. Not only literacy as the skill of reading, but multiple literacies. Teachers must acknowledge that students live in a world of multiliteracies (New London Group, 1996), including information literacy, media literacy, ICT literacy, civic literacy, health literacy , environmental literacy, economic literacy, and business and entrepreneurial literacy (Partnership for 21st Century Skills). The new roles of students and teachers is confirmed by a changing role of schools. The “new” school must reflect the needs of the students within it’s walls; creating a support system that allows students to gain the “multi-dimensional abilities” they will need in their life (Partnership for 21st Century Skills Framework). Therefore, the learning environment, the curriculum and instruction, the standards, and the assessments must reflect the skills that will be needed in the 21st century. Just as the expectations of students has been redefined, assessment of those skills and the supported policy must follow. Christensen, C.M., Horn M.B., & Johnson C.W. (2008). Distrupting Class: How Distruptive Innovation will Change the Way the World Learns, McGraw Hill: New York. Dewey, J. (1897). My pedagogic creed. School Journal, 54, p. 77-80. This entry was posted on July 14, 2011 at 5:07 pm	and is filed under Assessment & Policy. You can follow any responses to this entry through the RSS 2.0 feed. You can leave a response, or trackback from your own site.